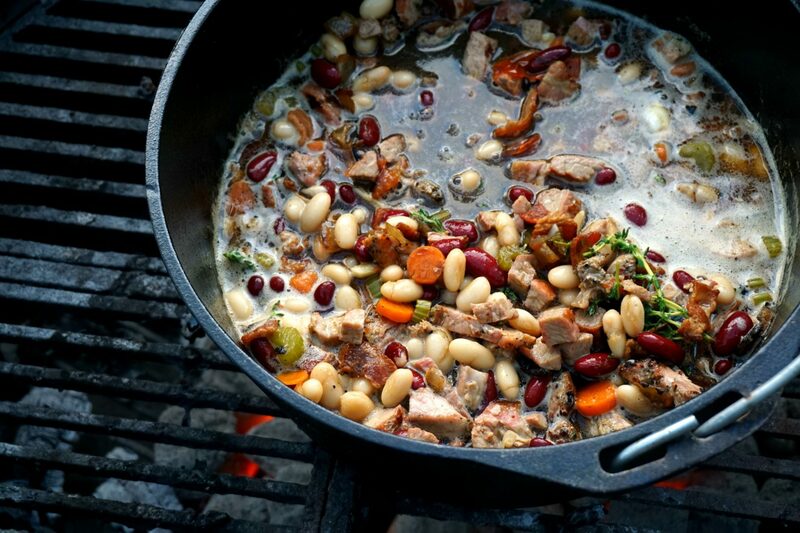 Cassoulet is like the French’s version of Pork and Beans. It’s a rustic, peasant dish, that is pure comfort food. Cassoulet (named for the casserole dish it cooks in) is often made with meat (pork, mutton, duck…) and pork skins and white beans. 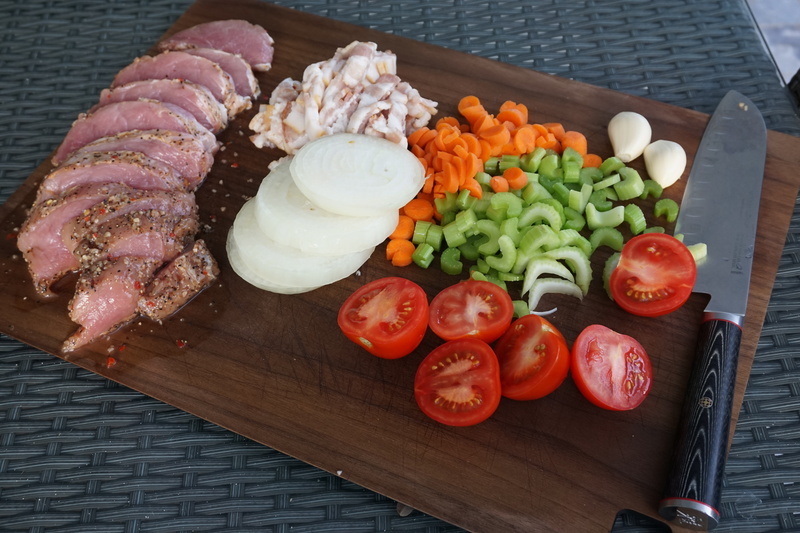 I’ve adapted this classic French dish for the grill, using Smithfield Applewood Smoked Bacon Marinated Fresh Pork Loin Filet, lots of bacon, fire roasted veggies for extra smoky flavor, Guinness, and beans. Yes, this recipe is a winner and can be made on the grill in a dutch oven in 30 minutes. 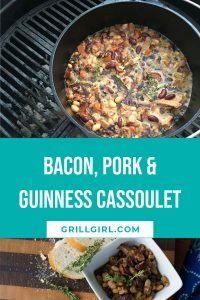 What really adds flavor to this recipe is that many of the ingredients are first grilled to add smokiness and flavor depth, and then deglazed and finished in a bacon and guinness infused broth. Pair this with grilled French Bread slathered in Compound Butter and you will go back for seconds and possibly thirds of this smoky, flavorful stew! 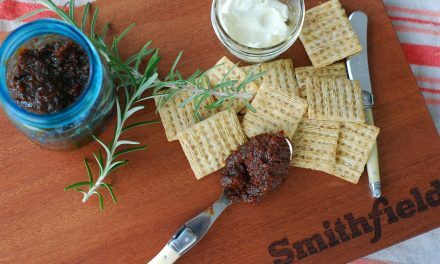 By the way, if you’re looking for recipes that can be made in 30 minutes or less, check out SmithfieldRealFlavorRealFast and you can find tons of recipes using Smithfield Marinated Fresh Pork that can go from fridge to table in a snap. You can also enter to win a trip to Napa (YESSS!) and other cool prizes by sharing your tips for making dinner in less than 30 minutes. Check it out! Heat your grill up, preparing it for medium direct cooking- at a temperature of approximately 350 degrees. This means you will be cooking directly over the fire! While the grill heats up go ahead and prepare your ingredients for the grill; chop the bacon, carrots and celery and garlic. Slice the tenderloin into 1/2 thick pieces, and slice onion into rings for the grill, cut the tomatoes in half. Get all your other ingredients ready to take outside- I usually put everything on a big cutting board and carry it outside and then get another plate for switching out. 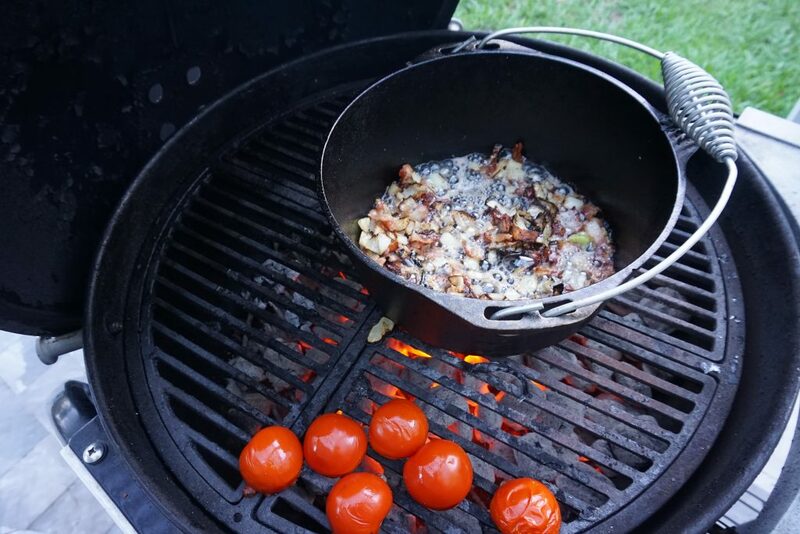 Once the grill is heated up, place the cast iron on one half of the grill and add the bacon and let it reduce. Meanwhile, with your existing grill surface area, go ahead and grill the pork tenderloin. This will only take a few minutes per side, remove once char marks have begun to form (remember these will also go into the stew and continue to cook). Next, grill the tomatoes and onions until char marks have formed, then remove from the grill. In the dutch oven, once the bacon fat has rendered, add the carrots and celery and let them cook in the bacon fat. Meanwhile, chop the onions and tomatoes and add to the dutch oven, stirring frequently to ensure no bacon is burning on the bottom. Now add the garlic. Next, add the first Guinness beer and deglaze the bottom of the pan. Add the sugar and stir. Now, chop the pork into small bite sized pieces and add to the dutch oven. 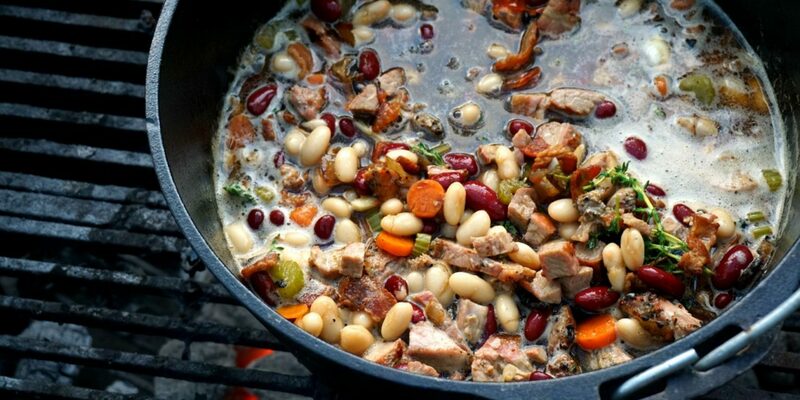 Last but not least, add the beans and thyme and let the cassoulet simmer for 10 minutes or until the liquid has reduced. If you like a more soup like stew, add another 1/2 to full beer, depending on how much time you have to let simmer. While the Cassoulet simmers on the grill, slice the French bread into 1” thick pieces and slather with butter on both sides. Grill very quickly – no more than a minute- to get grill marks, ensuring you don’t let it burn. Serve the Cassoulet with the grilled bread and be prepared for big smiles on the faces of your family- like I said, this recipe is pure comfort food and expect to add this to your list of recipes you make again and again. Also great for freezing and giving to those in need of an easy meal- like friends and family going through an illness or just home with a new baby. If you give this recipe a try, please let me know your thoughts in the comments below! Also, when reheating you’ll notice that the beans soak up a lot of the liquid. You can add more beer if you want more stew like consistency before reheating. 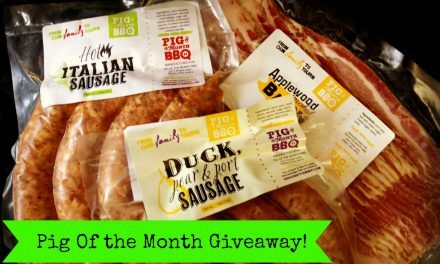 Note: this recipe was developed in partnership with Smithfield- I only partner with Brands I use and recommend! Smithfield has great pork products! Prep everything and then bring it out on a big platter or cutting board so you are ready to get grilling! 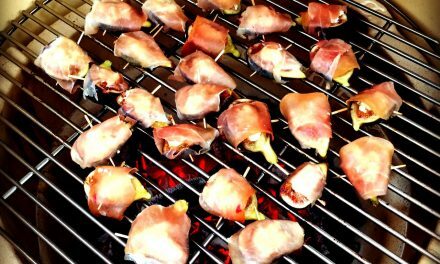 The smell of bacon fat rendering mixing with smoke from the grill is pure HEAVEN! The guinness bacon broth paired with smoky veggies and pork is a highly addictive combination.